The UK government has named a European consortium as its preferred bidder for a £13bn ($25bn; 19bn euro) contract to build refuelling aircraft for the RAF. The AirTanker group, led by European defence giant EADS, includes British firms Rolls-Royce and Cobham. Defence Secretary Geoff Hoon said the government would now "move on with the negotiations on the contract". The Private Finance Initiative (PFI) funded project is the biggest so far undertaken by the Ministry of Defence. Under the PFI scheme, the private sector will own and maintain the refuelling tankers on behalf of the RAF. The decision is expected to safeguard thousands of jobs in the UK. 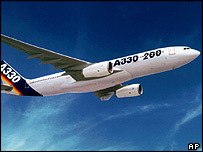 AirTanker plans to use 15 to 20 Airbus A330-200 planes to refuel RAF fighter jets and military planes. EADS owns 80% of Toulouse-based Airbus, with Britain's BAE Systems owning the remaining 20%. Mr Hoon last year described AirTanker's proposal as "the best prospective solution for the armed forces, the taxpayer and UK industry". When not in use for refuelling, the tankers would be converted to passenger planes or used for military transport purposes. The PFI project is expected to run for 27 years, with the first tanker coming into service in 2010.